When April came this year, someone high above flicked off the wind switch. The sea breezes vanish and are replaced with erratic northerlies, the very occasional strong westerly, errating north westerlies and the odd easterly. Rather frustrating for us kitesurfers. I need to get out! Today I went down to Rye hoping that the forecast 20knot north easterly would be still blowing, but on arrival things were rather quiet. One guys had his kite up (just) but was not going anywhere while another watched with his kite on the beach. The wind chart showed some reasonable wind in the morning though - so those who got there in time for it may have been rewarded. The winter winds are fickle, infrequent and transient. My friend Stuart had a good day last Saturday off Hampton, but I was in Castlemaine of the day. My solution is to keep on watching Baywinds and Seabreeze, and I have booked a ticket to Port Douglas for end July to catch some trade winds actions, and maybe even kite out to the Low Isles and back. Let me know if you will be up there too. 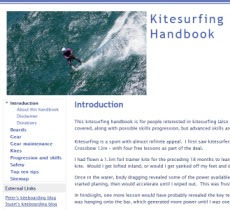 We could arrange a downwinder from Ellis Beach with Brett from Windswell, and maybe a kiting trip or two to the Outer Reef.